A high quality, low-cost Slow Motion Controller designed for demanding sports and broadcast production. Based on DNF’s field-proven, widely accepted ST300 Slow Motion Controller with a 4-line back-lit display and the ability to create, save and recall video segments. Provides fast, easy, reliable and precise “VTR-like” control over your DDR/Video Server. Supports the simultaneous record and playback capabilities of today’s DDR’s and video servers, up to 2 Record and 2 Playback channels. 100 cue points per playback channel. Cue points are retained when power is turned off. Mark IN/OUT points on the fly and playback segment without disrupting the record process. Create, save, and recall video segments for instant replays. Mark IN and OUT points using Record of Playback time. Press EE to quickly toggle between LIVE and PLAYBACK video. Familiar & intuitive user interface. T-Bar or tactile wheel provides fast and easy slow motion control. T-Bar speed range: 0% to 200%. Small footprint (12″ x 6″) fits almost anywhere – even in your lap! Powerful setup menu for personalized control features. ST304-DSR1K-T for the Sony DSR-DR1000 DDR. Supports 2 record and 2 playback channels. ST304-SRP-T for DDRs that support Simultaneous Record/Playback capability and BVW control protocol. Supports 2 record and 2 playback channels. 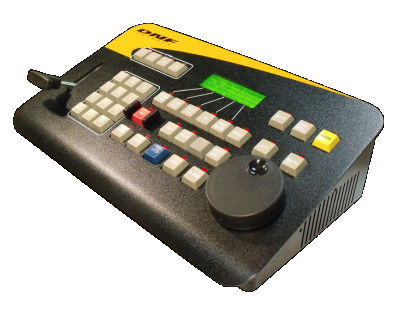 ST304-EDIT-T Slow Motion Controller with A/B Cuts Only Editing for VTRs/DDRs that support Sony BVW control protocol. ST304-SXD-T Slow Motion Controller with Segment Playout for Sony XDCAM. Peripheral Bus Interface option (PBIO) is available for all models.